Free games: Set sail by winning a Steam key for realistic co-op sailing sim, Sailaway! There are plenty of simulation games that let you drive fast cars, trucks, even planes. But what about boats? Sailaway is a game that lets you set sail across the world’s oceans, facing the open waters and terrifying tropical storms either alone or with online pals. Want a free game? Who doesn’t?! Check out the best free PC games. Sailaway has been Early Access for a while but is now available as a finished game. That’s why we’re giving you a chance to win a copy – in fact, we have 50 Steam keys up for grabs. But before we get to that, let’s have a closer look at Sailaway, so you know what you could win. 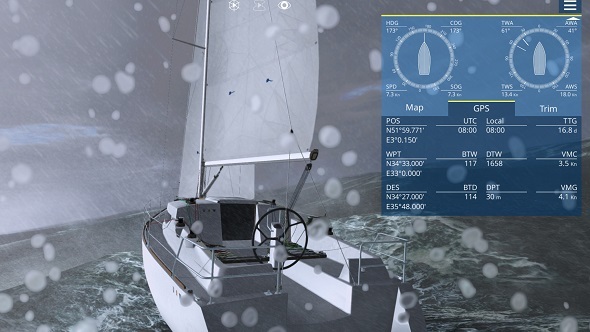 Sailaway fully simulates the process of sailing with realistic recreations of boats, the world’s oceans, and weather. You will need to learn how to hoist a sail, check in on real-time weather updates, and chart a safe course. If you’re really into sailing then you’ll be happy to know that a proper trip across the Pacific will take months, just like in reality. That’s a long time to be alone, though, so why not bring a friend onboard to help you with the duties. Or, you can race against friends in their own boats if you prefer competition over cooperation. As this is a communal game, Steam Workshop is supported so you can customise your boats however you wish and share your looks with friends. If you’re into all that and want to get started in Sailaway then you can purchase it on Steam right now. But you can also win a copy with us by entering the competition via the widget below. Every action you complete is worth one entry into the giveaway, and the more actions you complete the more chance you’ll have of winning. We’ll also need your email address so we can send you a code upon winning – we won’t send you spam, we promise.